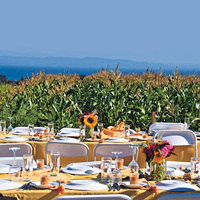 Celebrate the UCSC Farm & Garden and the Center for Agroecology & Sustainable Food Systems (CASFS) at the Seventh Annual Farm to Fork Benefit Dinner on Sunday, August 19 at the UC Santa Cruz Farm & Historic Cowell Ranch Hay Barn. Enjoy the culinary delights of award-winning My Mom's Mole, featuring locally sourced organic ingredients, including fresh and delicious CASFS-grown produce. Cesario Ruiz founded My Mom's Mole to "focus on traditional Mexican cuisine using responsibly sourced ingredients." Before you take your seat at the table, enjoy a field-side reception, appetizers, and organic farm tours led by CASFS staff and apprentices.